Stanley Z is a new listing for International Yacht Collection. 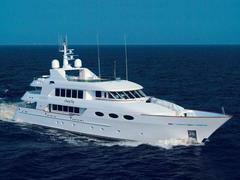 The 43.3 metre Trinity built superyacht, launched in 2003, has an asking price of US$19.5 million. “The owner is moving up to a bigger Trinity,” confirms Kevin Bonnie, the yacht’s central agent at IYC along with David Nichols. “Trinity Yachts are very good value,” he adds. Stanley Z will be at the Monaco Yacht Show and Bonnie is certain the Trinity Yacht will make an impact: “The yacht is going to be one of the most unique boats on the market,” he says.